It was interesting to observe some of the parallels between this past weekend and childhood memories of working on my dad’s fish farm. “Keep the lead line down!” rang out at regular intervals, referring to the weights that prevent fish from escaping beneath the net. Several times an exasperated father could be heard remonstrating with his sons for not using common sense. I guess it doesn’t matter whether you’re in Central California or Sub-Saharan Africa — some things are just universal. Last April during my first visit to site, I helped my counterpart Sebastian proofread his application for a loan through the CEEC (Citizens Economic Empowerment Commission) Micro Finance program. 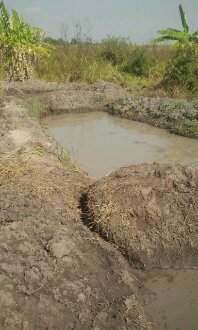 The CEEC is trying to boost development in one of the poorest parts of Zambia, and one area in particular they are focusing on is small-scale rural aquaculture. What a coincidence, I remarked when Sebastian told me about the loan program. That’s what I’m working on too! 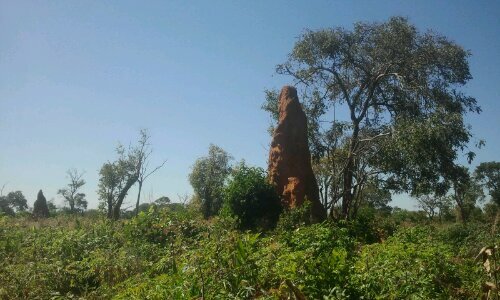 He chuckled nervously, hoping that this muzungu actually did know why he was coming to Nshinda. Don’t worry, I reassured him, I’m really a very funny person in my head. Fast-forward nine months, after several CEEC site inspections to determine feasibility of project success, countless attempts at corny humor, and numerous 40-kilometer round trip bike rides to the boma to harangue the powers-that-be at each step along the way, my counterpart and I are thick as thieves and the loan request has finally been approved. Sebastian biked into town yesterday to open an account with the bank, and within a few days the lump sum will be deposited. He’s about to receive a windfall: a loan of 80,000 kwacha, equivalent to about $16,000 USD. 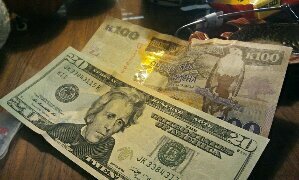 To put this in perspective, an average day’s wage in my little slice of sub-Saharan Africa is 10 kwacha, or around two bucks. This is basically like winning the lottery. And this is where the real work begins. Ever since I was posted to site, I’ve been lecturing my counterpart and anyone else who will listen about the importance of expense accounting, budgeting, and financial planning. (Why yes, I am that guy who likes to pore over personal finance blogs in his free time. Might not win me a ton of dates, but dammit my investment portfolio will thank me for it later.) It’s important for everyone, I admonish, but especially for small-business owners. You need to know what has gone into your farm and what you’re getting out of it in terms of time and resources and money. And because time and resources can also be quantified in money, it’s pretty much all about the money. Sebastian listens raptly. He’s one of the hardest-working and most motivated people I’ve ever met, but he isn’t super strong on the accounting side of business management and I worry that in the long term, listening might not be enough to reverse an entire culture’s worth of conditioning. It’s the blessing and the curse of living in an aid state. Donor dependency is a real barrier to sustainable long-term development here in a part of the world where people have grown accustomed to watching money flow from the coffers of well-intentioned muzungus. Because of the way that typical aid agencies operate, with too much overhead and too few boots on the ground, aid tends to stick grease-like to the places where the wheel squeaks the loudest. Big ideas and grandiose schemes that can be encapsulated in ten-second sound bites are given more weight than unsexy business skills training and capacity building for long-range planning. And as a result, bright, motivated individuals like my counterpart have learned to play the game. Sebastian is the squeaky wheel personified. He invests a lot of time and effort in making and maintaining connections with various government and non-government organizations dedicated to development in Zambia because he’s realized that, for better or for worse, this is what works. He gets things done in a country where things rarely get done because of his singular assertiveness and persistence in follow-through, qualities lacking in so many of his more reserved countrymen. And now this squeaky wheel is about to get more grease than it’s ever seen in its life. It’s not about the money, I tell Sebastian. 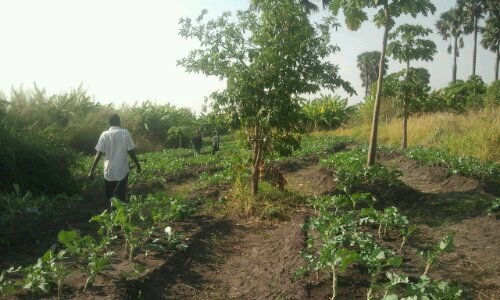 A successful business doesn’t use a loan as a gift but as an incentive: an incentive to turn this money into more money, to dig more ponds and branch out into more agricultural ventures not to provide growth statistics for aid agencies but in order to increase profit margins. I point out the 12% interest rate on the bank agreement. 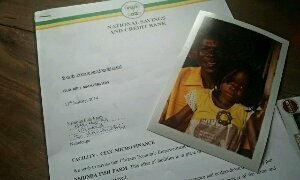 I make sure that he notes the 60-month loan tenure. You’ve got five years, I warn him. Let’s make them count. My counterpart already has big plans to expand his farm outward. 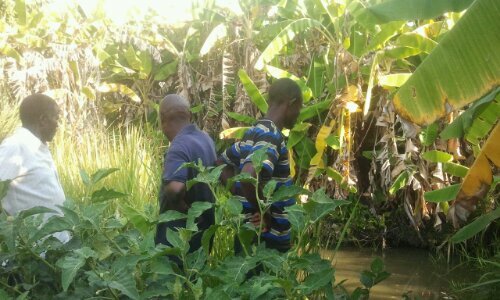 To hire men in the community as full-time employees and eventual new fish farmers. 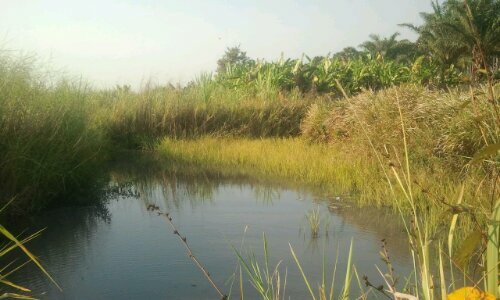 (His current 20-pond farm has been entirely dug, renovated, and maintained over the past eight years by the one-man force of Sebastian Lubinda.) To purchase more supplemental feed. To integrate his fish farm with goats, pigs, and ducks. To train many of his 13 children in the family business. 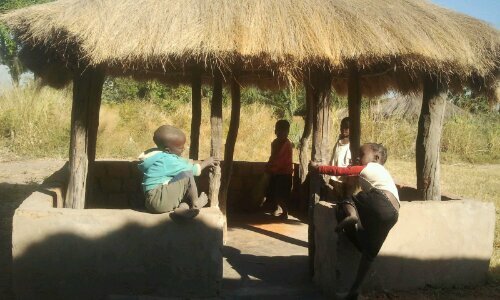 Even to build another house in the village, with a mindful eye on accommodating the second and third generations of Peace Corps volunteers after I leave. Something that I greatly admire in Sebastian is that he has the gift of farsight. He has the desire and determination to create a better future for his children, and his children’s children, and by extension for Zambia and for the world. He has the ability to imagine the life that he wants for himself and his family, and the knowledge and skill to achieve this vision. And now he will have the financial resources to help him realize his dream, too. It’s not about the money. But I concede that it does help. No big venture is without its risks, and building a stronger future is a risk well worth taking. As I sit here in my mud hut writing this blog post, a wave of pride for Sebastian washes over me. For my counterpart, for my community, for my country of service. And I can’t help smiling to myself. So this is what development feels like. Fish farming isn’t very glamorous. It’s grimy, strenuous, blue-collar work characterized by dirt under your fingernails and the faint odor of mud rising from your pores no matter how many times you bathe. 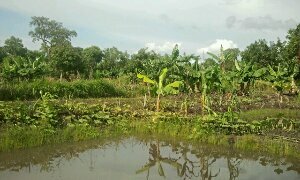 My dad served in the Peace Corps as an aquaculture volunteer in Papua New Guinea from 1981-1985, started a fish farm shortly after returning to the States, and has been growing, harvesting, and selling fish and water plants ever since. He loves it. I served bags of Fritos and grape-flavored Simply Sodas to my grandpa’s grinning workers for 25 cents each from 1996-1998, started thinking pretty much exclusively about girls shortly after hitting puberty, and had been dreaming of a nice, clean, air-conditioned office job ever since those long summers as a kid spent toiling away in the murky water and the 110-degree San Joaquin Valley heat. Me growing up, not so thrilled about fish farming. 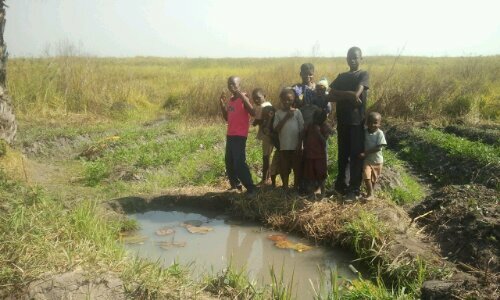 So of course once I was an adult who could make his own decisions, I left my nice, clean, air-conditioned office job, joined the Peace Corps, and now live without air conditioning in sub-Saharan Africa working as a Rural Aquaculture Promotion (RAP) volunteer. Or, in other words, fish farming. Although my 15-year-old self may not have appreciated fully all of the life lessons that his father assured him he was gleaning from the muck and sweat and pungent carcasses of rotting fish, my 25-year-old self is appreciative of the role fish farming played in his personal development and thinks there’s a neat sort of circularity in the way that this has informed and led to his life as a fish farming volunteer a decade later. 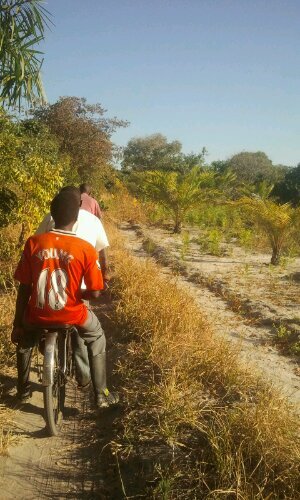 Patrick Chansa is a bright 20-year-old who finished secondary school last year, speaks fluent English, and wants to study forestry at the University of Zambia. 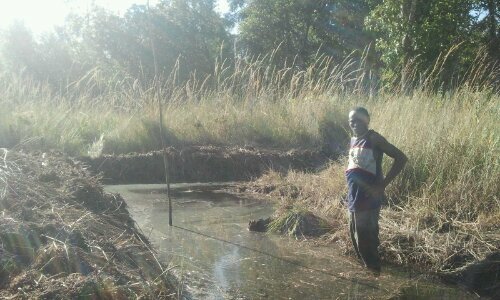 For the time being though, Patrick is a member of a newly formed fish farming group in Kampampi. 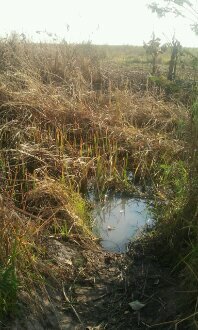 Last Wednesday he took me to visit their new pond site. After reaching town, we turned off the tarmac onto a bush path that twisted through a bucolic forest and then coasted down into a vast grassy dambo valley. 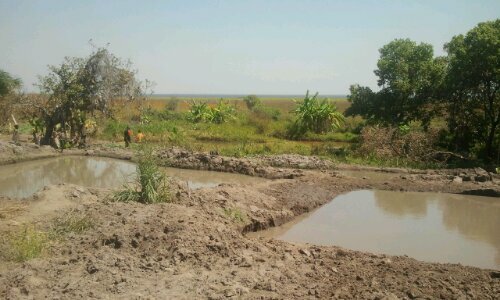 The pond was almost finished, smelling like freshly turned mud. The smell of development (my personal madeleine). From my perch on the muddy bank I offered some advice for remaining pond construction and beginning management, describing the benefits of making the pond walls sloped (“to give the fish better spawning habitat!”) and extolling the virtues of adding manure and plant compost to the water (“once it turns green, that’s when you’ll know you have a good bloom!”). 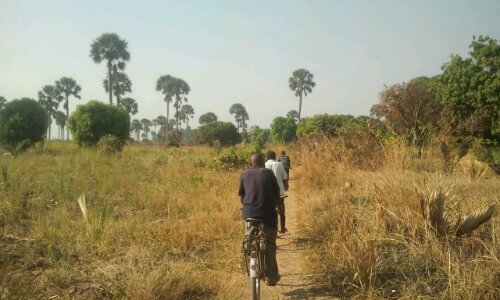 On Friday afternoon I biked over to Chabilikila to host a pond staking workshop with my nearest PCV neighbor, Sarah. 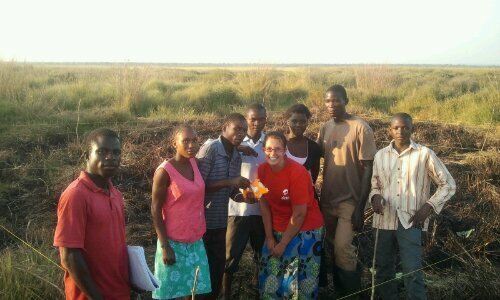 As a CHIP volunteer most of Sarah’s work is with community health, but her youth group wants to start fish farming so I agreed to come over and provide a physical blueprint for where and how much to dig. The workshop was scheduled to start at 14:30, which meant the group hadn’t fully arrived until 16:00 – punctuality is a foreign concept for Zambian meetings. No matter, this just meant I was able to spend more time catching up with Sarah, a former preschool teacher who is, true to vocational stereotypes, exceptionally good-humored and patient as a saint. Once the gang had all assembled, we headed out to the pond site. 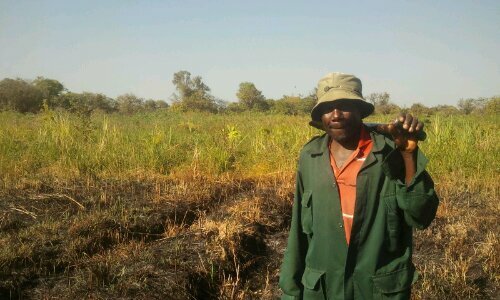 The roughly 15 x 15 meter square of swampy land had been slashed (tall grass cut short) and burned to clear the plot upon request before my arrival. Rubbing some dirt under my fingernails, I got to work explaining the purpose of the pond staking and demonstrating each step of the process. 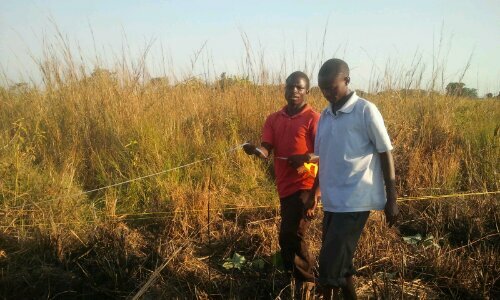 Together we appropriated small tree branches for use as pond stakes, measured out the perimeter of the pond, hammered in stakes, calculated the slope of the dike walls, and linked all of the stakes together using twine.